Maryland Governor Larry Hogan signed legislation into law that would ban pigeon shoots in the state! We are extraordinarily pleased to announce that on May 15, 2018, Maryland Governor Larry Hogan signed legislation into law that would ban pigeon shoots in the state! This is a fantastic turn of events and it flows directly from our work in MD. • In April of 2017, SHARK discovered that a live pigeon shoot was to be held at a MD hunting business called Schrader’s Outdoors. We contacted the MD Division of Natural Resources (DNR) and made the long trip from Illinois to Maryland on the day of the scheduled shoot. As we had announced we were coming - because we wanted the shoot to be cancelled - Schrader’s realized they couldn’t go ahead and therefore cancelled the shoot. While there, we spoke to MD DNR police officers about the issue and used our drones to film the pigeon shooting arena. • Over the following months, we repeatedly contacted MD DNR and MD Office of Attorney General regarding Schrader’s and what the legality of pigeon shoots were, as we did not want this issue to be forgotten. • In October 2017, and at the request of MD DNR, legislation was introduced that would ban pigeon shoots. • On January 15, 2018, SHARK received a tip that Schrader’s had held a pigeon shoot that day. The following day, SHARK Investigator Stu Chaifetz went undercover at Schrader’s to see if he could find any evidence that a shoot had been held. 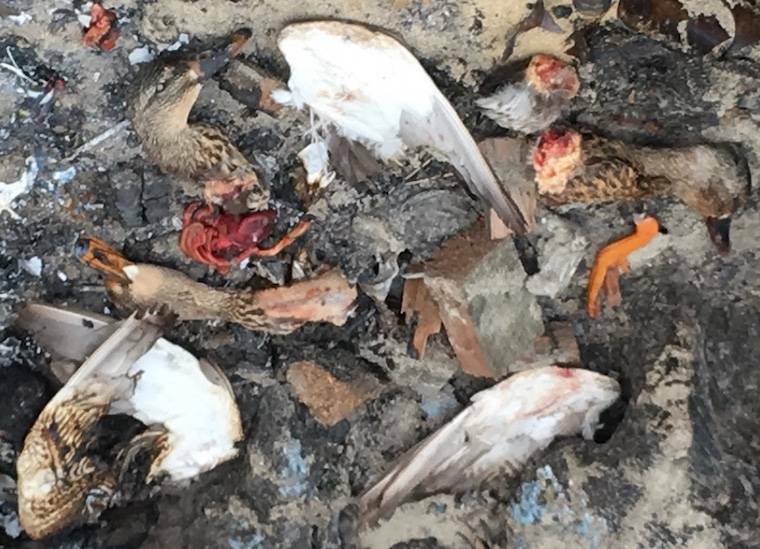 Not only did he find that evidence, such as massive burn pit filled with charred bodies of pigeons, ducks and geese, but a Schrader’s worker admitted to him that there had been a pigeon shoot - and then he proceeded to shoot some pigeons that had survived that massacre. All of that dramatic footage was captured and released publicly. • SHARK sent the evidence of the 1/15 incident to the MD DNR and an investigation was carried out into potential illegalities. While DNR wouldn’t tell us the result of that investigation, the legislation that they asked for moved quickly through the legislature, passing both houses and being signed into law yesterday. We sincerely want to thank MD DNR for asking for this legislation and helping it become law. We also want to thank all of the MD Senate and House of Delegates who voted for it, and for Governor Hogan who signed it into law. It cannot be understated how important our work on this campaign was; SHARK was the only group on the ground at Schrader’s, filming the pigeon shoot arena and going undercover to gather evidence. We put ourselves on the line in what could have been a dangerous operation while others, such as the Humane Society of the United States (HSUS), who were much closer, stayed far away. Please know that when you hear HSUS take credit for this, they were never there. This victory would not have happened without our efforts. We must also note this is the second major pro-animal law in Maryland that came directly from SHARK’s work. In 2017, after our video of cownose rays being tortured and killed went viral and received international news coverage, the MD Legislature passed a moratorium on cownose ray killing contests. We should note this victory comes on the heels of other such victories, such as the shutting down of an annual pigeon shoot held by the Alabama Forestry Association, many sponsors withdrawing support for the Minnesota Horse and Hunt Club after we released video of a pheasant slaughter and the release of our massive work on a Canadian rodeo project that may very well end rodeos in Quebec. SHARK spends no money on fundraising and no one here gets paid six figure salaries with bloated expense accounts. In fact, I have always been unpaid as President/Investigator for SHARK. We allow our work to speak for itself. If you are as overjoyed as we are with this amazing new pro-animal law that came from our efforts and expense, then please consider sending SHARK a generous donation so that we can continue to score victories for the animals.